Create HDR panoramas with Easypano Panoweaver! HDR is abbreviation of High Dynamic Range. In graphics, high dynamic range refers to the ratio of the maximum lightness level to minimum lightness level. To make HDR panorama, you can use photo stitching software Panoweaver. HDR solution to resolve over exposure and under exposure problem. 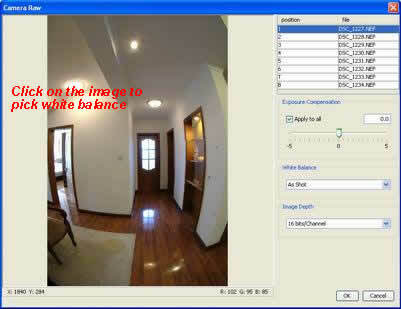 Creation of HDR image and converting HDR to LDR image. There are two methods. One is to import Camera Raw file and to stitch it into 16 bit panoramic image. The other is to get HDR image from bracket exposure, that is, to shoot several groups of images of the same location with different exposure values, stitch each group into panoramas and then combine them to get HDR image. Note: Create HDR image feature is available in panorama software Panoweaver Professional Edition. Check online video tutorial for creating HDR image. Import camera RAW files in Panoweaver 8 Professional edition to stitch panorama. Shoot the same location with different exposure values, and stitch each group of images with Panoweaver 8 Professional to get a panoramic image. Open ..Panoweaver 8 Professional Edition -> Create HDR Image, and click to open the stitched panoramic images, and then click create HDR button to combine HDR panorama. Change Bit Depth to 8 bit and adjust exposure and gamma values. Then save the panorama.